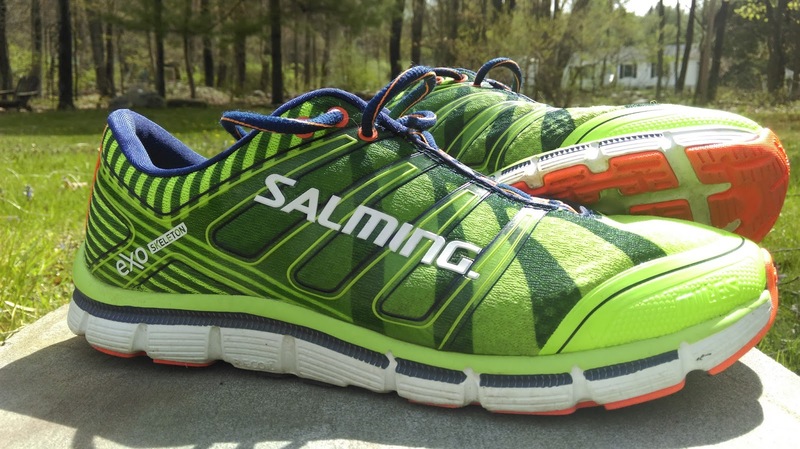 Salming Miles is a brand new shoe from Salming Running, meant to go the long distance. According to Salming: "The purpose of the Salming Miles running shoe is to add a more cushioned shoe without compromising the Salming concept and principles. It is built to stand the tear and wear of long distance asphalt and tarmac running. 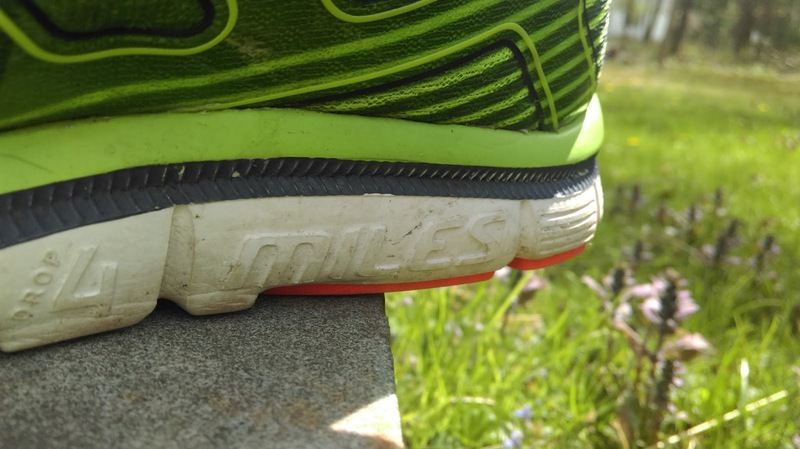 Miles has a Drop 4mm construction but compared to the popular and award winning Distance model, Miles has more heel and fore foot cushioning and the new responsive Recoil midsole compound." Miles is compared to the Salming's other trainer "Distance". To me "Distance" is more of a performance shoe. When comparing Miles with Distance its a big difference. Miles is a lot of shoe. When I say a lot I mean a lot of everything, I will go in detail under each section of the shoe. Distance is more snug and has a more performance oriented feel to it. 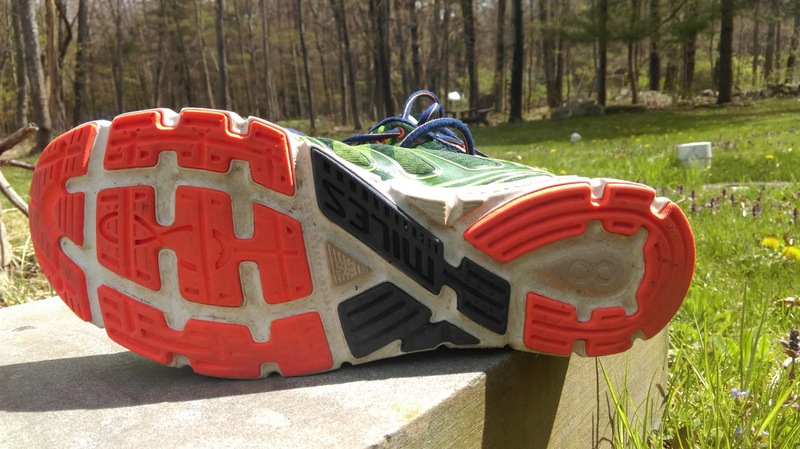 Before this review, I have used "Miles" during my Boston training, so far I have put over 300 miles on my pair. Disclosure of Material Connection: I receive Running shoes from Salming Running North America as part of their Salming brand ambassador program. I was not required to write a positive review. The opinions I have expressed are my own. I am disclosing this in accordance with the Federal Trade Commission’s 16 CFR, Part 255: “Guides Concerning the Use of Endorsements and Testimonials in Advertising. Miles offer a seemless upper made out two layers of mesh , plus the " Exo Skeleton" that keep the foot in place. The upper is very roomy with an oversized toebox for a great toe display. At first I did not like how the mesh kind folded unnaturally in the forefoot but after a few "break in runs" it seems like the mesh has adopted to my foot or molded itself after my foot if you like. The toebox is very roomy and there is plenty of room for your toes to display. When looking at the upper it seems like its a lot going on. When I first saw pictures of "Miles" I thought "man that is a lot of overlays". The darker blue stripes has no function its just part of the visual design. offer the shoe feels lighter while you're running. You can easy pick up the pace with Miles and take advantage of the Recoil midsole energy return. Miles has a lot of outsole rubber and deep lugs, according to Salming website the lugs are 8mm deep. The thickness of the rubber feels a bit overkill to me. According to the website the outsole should provide great grip on "gravel, rocks and roots" as well. As I understand this shoe is built for roads in mind and I cant quite understand why Miles has these deep lugs and amount of rubber. The durability of the rubber has been great but is on the firmer side. The lugs/rubber still looks like new after 300+ miles as well. For sure the lugs and rubber provide a great grip on all kinds of surfaces and it makes the shoe almost a hybrid road/trail shoe. Midsole also offer a torsion unit for some extra sturdiness in the midfoot area. It took about 50 miles for me to really start enjoy this new shoe offer from Salming. At first I thought the Miles was to clumpsy and to much shoe. But as the shoe was "broken in", I started to really enjoy the energy and protection Miles offered. I was surprised how well the new Recoil adopted to my running, long runs no problem, the protection is there. When I wanted to pick up the paces, the Recoil compound responded really well and Miles felt light on my feet. The outsole rubber and the lugs under shoe felt a bit to much. All other Salming road shoes has a thinner layer of rubber and the durability and grip has worked great, Miles could use the same amount of rubber as its Salming siblings for a better road feel and lighten up the shoe. Miles might be the Ultrarunners dream, it can for sure go the distance, has enough protection and offers great grip on both roads and trails. 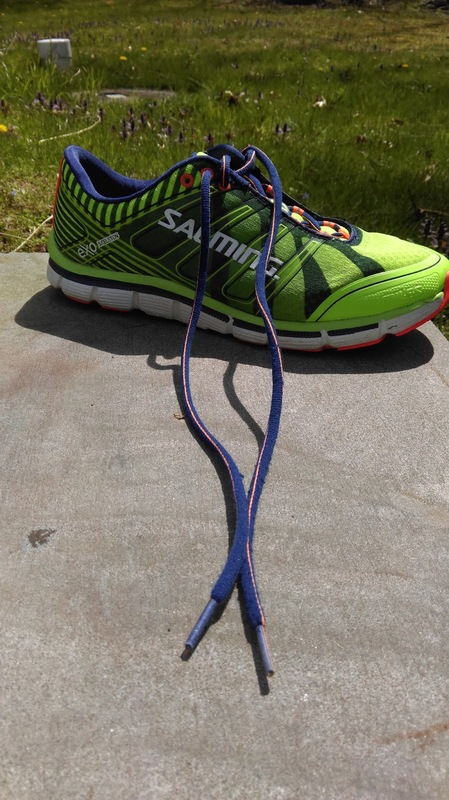 I have to give Salming credit for the laces, some companies goes cheap but that is not the case here, the only thing is, you can cut the laces in half and you still have enough. I ended up doing most of my Boston training with Miles and I like the shoe a lot, of course their is room for improvements but Miles fits in well with the other Salming shoes. Sounds like another great offering from Salming - thanks for the review Stefan! Interesting read! I have ran a lot in Distance, I have covered nearly 1000 miles in my first pair and they are still in good shape. I like the Distance model for its versatility, light enough for fast pace runs, cushioned enough for marathon long runs (for me as a lightweight runner) :-) However, I rotate shoes a lot, not just Salming and if I run a lot in Distance only I tend to get a bit sore, something that I have heard from other runners so I think there is room for Miles here as a more cushioned alternative!